Michael Schumacher took pole position for the San Marino Grand Prix - and perhaps that was the key moment of the Imola weekend. No-one knew why the car was suddenly so much quicker than it had been in Australia and Malaysia but obviously there was a little black magic from Bridgestone. The Ferrari people also talked of more power and a better performance from the chassis but the kind of gain in time seen between the races was such that the tyres had to have played a major role and specifically the performance of the tyres over one lap. In warmer conditions Bridgestone was always expected to be on the pace of Michelin after the testing during the winter and at Imola it was warm and sunny all the time. Whatever the case, Ferrari was obviously pushing to the absolute maximum because when it came to fettling the cars in parc ferme, Ferrari asked the FIA Technical Delegate to allow them to change the entire fuel pump system. This was hidden away in an obscure FIA press release but it was interesting nonetheless. The team explained that this was necessary because of a fuel pressure problem. Perhaps this gave the opposition hope that the Ferrari would blow up on Sunday afternoon but that did not happen. Michael translated his pole position into the lead at the start while the man everyone was watching - Fernando Alonso - got himself boxed in by Felipe Massa and Rubens Barrichello so could not make much use of his Renault starting system. This meant that Fernando's hopes of making up places at the start were dashed and he was fourth at the end of the first lap. Rubens Barrichello had lost two places in the hurly-burly but otherwise there was not much to report beyond the fact that Kimi Raikkonen did not get a good start and dropped from eighth to 10th. Down at the back there was a much bigger story as Christijan Albers went out of the race in spectacular fashion thanks to Yuji Ide putting a wheel in the wrong place at the wrong time. The flying Dutchman was justifiably irritated by this when he emerged from the wreck of his Midland after four and a half rolls. "With all due respect to the Super Aguri drivers, they are being much too aggressive in trying to jump ahead of us at the start so they can hold us up during the race," said Albers. "They are taking too many risks and we saw today how dangerous that can be." One would like to say that one agreed with him but expecting the opposition to move over and let him get ahead is not really the right idea in F1. Ide may have made a dumb mistake but expecting his not to try is perhaps a little unrealistic. The FIA Stewards felt that Yuji should be reprimanded which sounded about right. Once the mess was cleared up and the race restarted there was little really that changed. 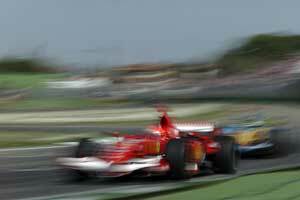 There is no overtaking at Imola and so it is all down to strategic activity and fuel loads. It really does not matter that much if your tyres suddenly hit the critical point and help you lap two seconds a lap faster when you soon get stuck behind the next car up the road ahead of you. And so we waited, wondering who would be the first to head for the pits. We had suspected that the two Hondas would be the first in and that proved to be correct. Barrichello pulled into the pits a lap before Button. Ralf Schumacher went a lap further. Jarno Trulli was gone after just a few laps with a mechanical failure and suddenly the Japanese cars had all gone and we were left with Michael Schumacher leading Felipe Massa and Fernando Alonso. The Renault was clearly stuck behind Massa. Once Button disappeared Massa seemed to slow down and for three important laps Schumacher pulled away and Alonso lost time behind Massa. The gain was about three seconds but at Imola that sort of figure can be the difference between victory and defeat. Then Massa pulled off and went into the pits and suddenly Alonso was a second a lap faster. Michael pitted next and so Alonso had the road to himself for five laps before he pitted. When he rejoined Massa was not a problem any longer. His lost time now hurt him. With only Michael ahead, Fernando was quickly closing in. The gap was 11.2secs on lap 26 and 0.4secs on lap 34. And then, just as Alonso arrived behind him. Michael suddenly slowed, his lap times falling from 1m26s to 1m28s. Michael for some reason explained this away as being a tyre graining problem. After the race when asked Bridgestone seemed mystified that Michael should have struggled but one is tempted to suggest that perhaps the tyres were not really the issue. It was much more logical that Michael was slowing down Alonso in order to stop the Renault using its obvious car advantage to win the race. If Fernando had more fuel and was going on for longer and was still able to lap faster than Michael, the best thing for Ferrari would be to try to negate the potential gains and hope that Renault would pit early, worried that Schumacher might be going on longer than anticipated. As soon as Fernando went into the pits, Michael did a very fast lap and then covered the move. As Schumacher accelerated out of the pits he was still just ahead of the Renault and at Imola that is all that you need to win. In the final laps Alonso piled on the pressure but in the end he made a mistake and immediately understood that it was time to turn down the revs and settle for second place. Michael Schumacher went home with 10 points. Alonso took eight. He remains 15 points ahead of Schumacher in the Drivers' Championship. Juan Pablo Montoya came home third and that was really the best the team could have hoped for. The McLaren is not a quick enough car at the moment. Honda's strategy did not really make sense because of mistakes in the pitlane. Jenson had a problem with his right rear on his first stop. Rubens had a problem with a sensor during his first stop and then Jenson had the big problem with the lollipop at the second pit stop." No-one else was really in the race although Webber did a tough job with his Williams which was a handful with a big tank of fuel and marginal brakes. In the end Webber went from 10th on the grid to sixth in the race. That seemed a fair reflection on the speed of the car. It was an impressive win for Ferrari but perhaps we should be careful not to be drawn into the belief that Ferrari is reviving. The fact remains that if Ferrari wants to beat Renault the team needs to improve the car. It was a good effort at Imola but more is needed.